Charlotte Glass thinks she knows what love is, but she hasn’t met Ian MacKay. After five years with her self-absorbed boyfriend, librarian Charlotte Glass surprises them both and breaks up with him. Before parting, he bitterly tells her to have fun on their upcoming romantic vacation—alone. 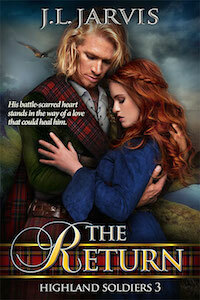 Two days later, Charlotte arrives at a remote cliffside castle in the Highlands of Scotland. Overwhelmed by its breathtaking beauty but desperately jet lagged, she sinks into her sumptuous bed for a quick power nap. She awakens in the middle of the night and heads for the castle library. There, beside a glowing fireplace, sits a strapping Scotsman with a glint in his gentle gray eyes. Ian MacKay has too much charm for anyone’s good. But he also has scars and secrets. One thing that’s no secret is his interest in Charlotte. At first, it seems harmless. She’ll be gone in a week. But a week is long enough for Ian to know that he’s falling in love—and that the truth will destroy it. This Christmas, find love in this contemporary holiday romance about overcoming life’s mistakes and setbacks to discover what love truly can be.